The ancient armies of Macedonia and Persia are yours to command in this portable and exciting tile-based war game. You'll fight on three fronts with armies you create for each battle, making every battle a new experience. The size of the armies is agreed upon and formed according to the point values of the troops. Combat takes place in three zones and each zone has two areas (front and rear), while the engagement zone is in the middle. Each troop tile forms a unit and can fire ranged weapons and/or engage in melee. Some troops have special abilities which are described on the player aids. Pocket Battles: Macedonians vs. Persians is a wargame that easy to learn, inexpensive, fast, portable and requires minimum table space! 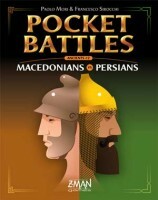 Add a Review for "Pocket Battles: Macedonians vs. Persians"